A Vanden Plas, you're well posh! Yes, indeed, I have seen the colour written down as Green Mallard but I assumed it was a spelling typing error. Interesting to hear you prefer driving them in comparison to your Minis Can you explain why? It's refreshing to hear. Who is John? Where do he reside? It's not Glacier White. 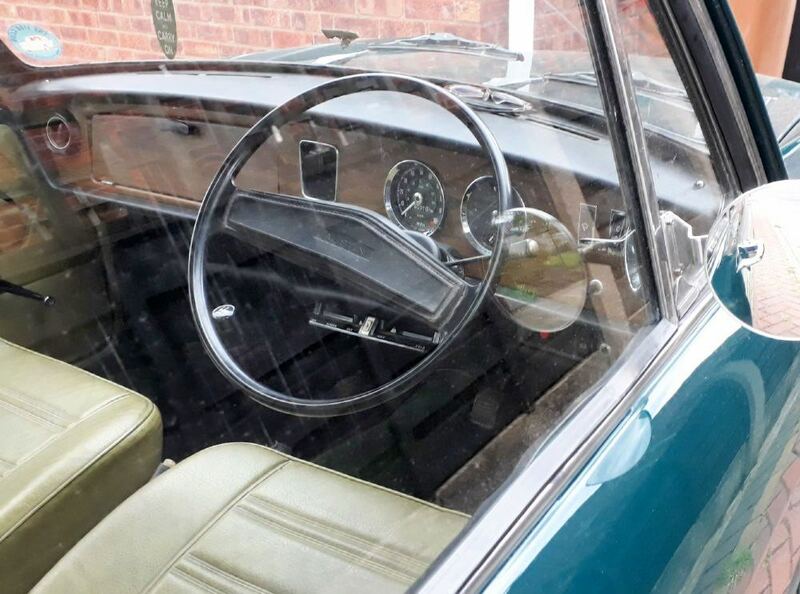 I am told by a local classic car dealer that it is indeed Limeflower Took Nutter for a tune up and fettle today and the mechanic spotted the interior straight away and said "Oh, you have Limeflower interior". Do you have a 1100/1300, tedmcedd? The Minis I own are wet suspension Cooper S cars and in comparison with the 1100 1300 cars they are much more uncomfortable and noisy to drive. The ADO16 with the hydrolastic suspension are much more quiet and gentle to drive. I bought my Moss Green 1971 Vanden Plas Mk2 in 2011 from the original lady owner who bought it new in December 1971 and kept it 40 years. It has a factory 1293 Fast Road 95 horsepower Spec Oselli package fitted and it is lovely to drive with good manners. The John I referred to is John Friel who resides at Johnstown, Lusk, County Dublin. As I said John has the largest collection of ADO16s in the northern hemisphere we believe. We all met at John and Kathleen Friel’s house on 27 August 2016 when the 1100 Club did the Ireland Heritage Tour. We all had a great time and I believe it will happen again very soon. John has a nickname Glacier White because it is his favourite colour and he has a Glacier White Mk3 VP and a Mk3 Glacier White Wolseley 1300 and others. That is how I got Demetris mixed up with John on this forum. The Mark III was most notable because BLMC replaced the previous self locking bonnet stay with the 'bit of bent wire' from the Mini to save a few quid. Teal blue with Limeflower was the best to my eyes. Welcome to the forum and the 1100 club, both are fantastic and full of very handy people to know. Regarding preference , I love my 1300 gt , I have sold my vanden plas but it was a very reliable comfy drive. I have had various minis and do still own one but getting older , the extra few inches of the 1300 makes it a better car for me, if you want to hack about and feel some G force then stick to a mini , it probably puts a bigger smile on your face. either way you will love the 1300 and it does indeed look to be a very nice car. The GT , being a Morris is a mk 2 and having had mk 3s (some time ago) there is not much difference in them.